Whether you work from home or the office, a computer desk ensures efficiency and helps to keep things organized. 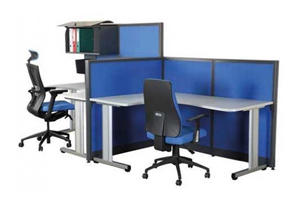 Call us if you are looking for durable workstation furniture. Choose from products designed to serve a broad range of purposes - from providing plenty of storage space to keeping things organized. Buy a computer desk in virtually any color, dimension, material, style, and shape you desire. Now you can create a workspace for maximum efficiency and comfort. OfficeRock.com is UAE's largest online supplier of office supplies and stationery. We're direct resellers of major office furniture across the world. We offer computer desk options and other related furniture and accessories at affordable rates. Contact us to order a computer desk customized to your preference. We'll come to your workplace to discuss requirements. We deliver anywhere within the UAE, and all orders are delivered within five working days.